The Dakota Digital BIM-19-2 Quad Air Pressure Module allows you to monitor 2- 4 bag pressures on your air ride system. Choose between a 4 corner, left and right or front and rear pressure system. Also available tank pressure reading. 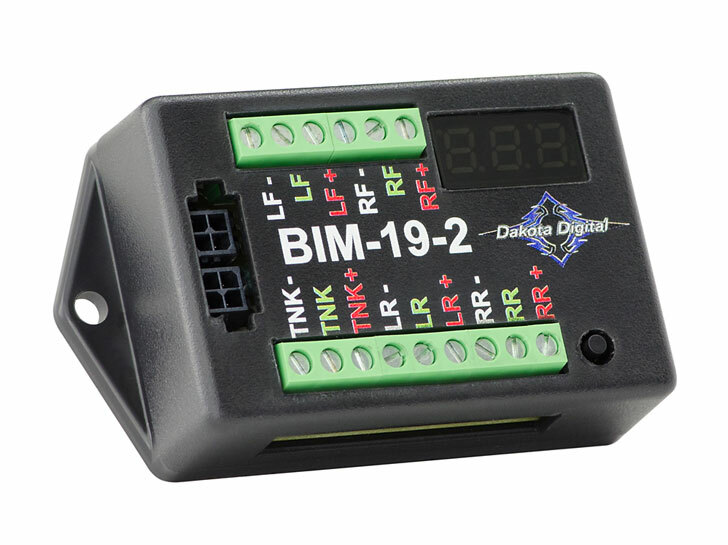 *The BIM-19-2 is designed to and supply this information to the RTX, HDX, VHX and VFD3 systems with a black plastic control module. For any BIM-compatible control boxes which contain the 3.5mm headphone jack BIM input, add part number 394193 adaptor harness. Earlier instrument systems with an aluminum control module are not capable of BIM connectivity.